*Excludes taxes/fees - 1st month $1 when you prepay for 2nd. INCLUDES FREE TRUCK! $25 OFF!! PLUS FREE TRUCK RENTAL!! Welcome to Storage Master Franklin. 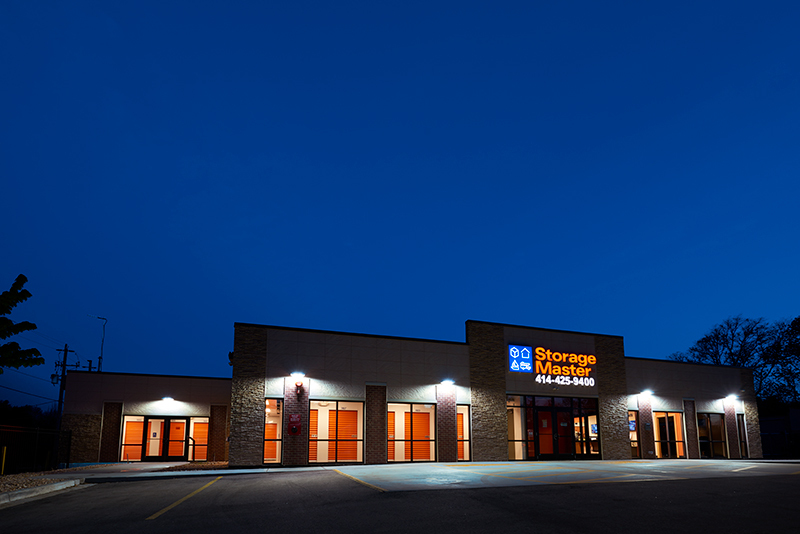 We set the standard for storage solutions in Franklin, WI in terms of price, quality and convenience. 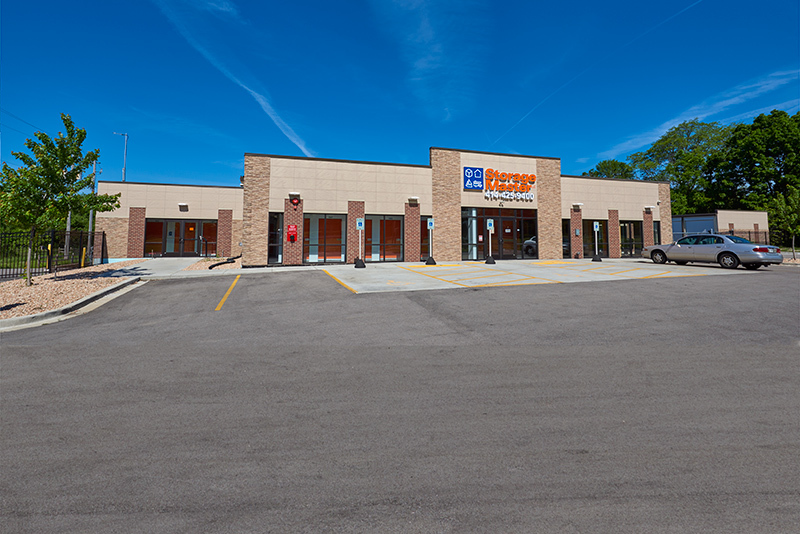 Our new, state of the art facility is located at 6951 S Lovers Lane, Franklin, and is also conveniently located for residents of Hales Corners and Greendale. 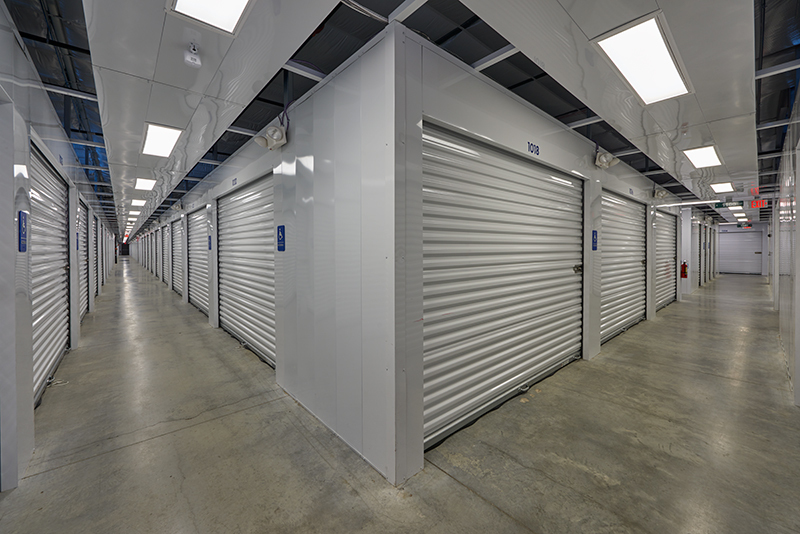 We offer a wide selection of storage units and climate and non-climate controlled units to make sure you can get the one that matches your storage needs. Our on site managers are always ready to help you find the right unit for you. 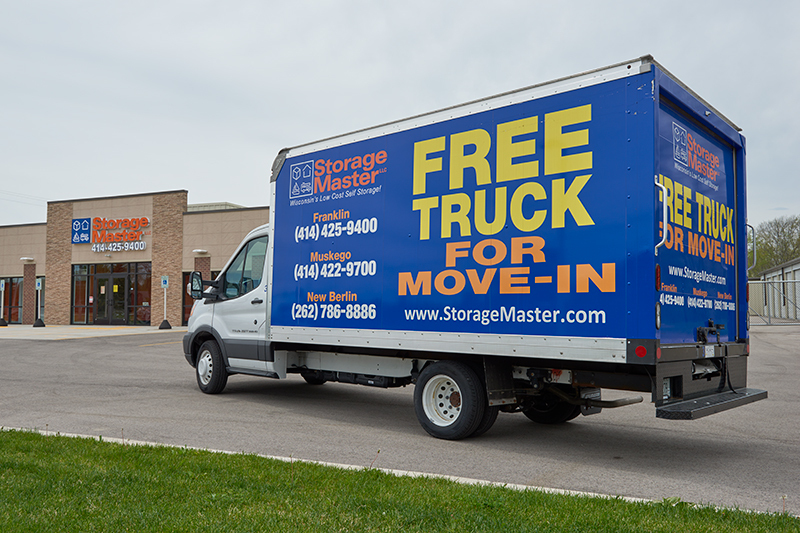 We have boxes and moving supplies on site and even offer free truck use to help you move in. In Wisconsin, we experience all 4 seasons, sometimes all in the same week! For your convenience, we offer indoor storage units for you to load, unload and store your belongings, safe from the elements. Call one of our friendly, professional staff members for more information or any questions you may have or reserve online today. Terry Lancaster in the last week Get service. Very easy to access and the price is affordable. Sandi Young in the last week Everyone was wonderful to deal with and very helpful. Great place! Nicole Lemus in the last week Just rented a large heated unit and had a great experience with Keith- incredibly helpful and nice. The units are very clean and the location is great. Rachel Evers in the last week I've looked at a few different options for storage locally and was excited to find this place! Good price and the service is excellent. Elizabeth Vierthaler in the last week I called to get a price on units and the guy on the phone was helpful. He even sent the lease to my email for me to fill out. He explained all the pricing thoroughly so nothing was a surprise. When I came in to pay and get my keys, the man who helped me was also very thorough. He had me practice how to use the lock, gave me a map, showed me the loading dock, and made sure I felt confident I had everything I needed before I left. It was nice to get more than, "here's your keys, map, now I have to go." A Google User a week ago I called to get a price on units and the guy on the phone was helpful. He even sent the lease to my email for me to fill out. He explained all the pricing thoroughly so nothing was a surprise. When I came in to pay and get my keys, the man who helped me was also very thorough. He had me practice how to use the lock, gave me a map, showed me the loading dock, and made sure I felt confident I had everything I needed before I left. It was nice to get more than, "here's your keys, map, now I have to go." Laura Staats in the last week The facility and my storage unit is spotless...cleanest storage unit I've ever had. Thanks! A Google User 2 months ago The facility and my storage unit is spotless...cleanest storage unit I've ever had. Thanks! Rob Kandetzke in the last week I'm back again for the second time in a few years. Since my last experience went so well, I didn't hesitate to call Tom again to rent a unit. Just like last time, everything went very smooth and I can relax knowing my possessions are in good hands. Update 6-13-18 I just finished loading up my second unit. I wasn't sure if I was going to need it, but Tom was ready and waiting for me and once I decided a second unit was required, he set me up in record time. During the unloading he even brought me a cold water. I can't say enough good things about the service and facilities. A Google User 2 months ago I'm back again for the second time in a few years. Since my last experience went so well, I didn't hesitate to call Tom again to rent a unit. Just like last time, everything went very smooth and I can relax knowing my possessions are in good hands. Update 6-13-18 I just finished loading up my second unit. I wasn't sure if I was going to need it, but Tom was ready and waiting for me and once I decided a second unit was required, he set me up in record time. During the unloading he even brought me a cold water. I can't say enough good things about the service and facilities. Jaime Drewitz in the last week I just recently moved in. I had an issue with getting a truck, but Matt went above and beyond to make things work out. I really appreciated all they did! I love how clean everything was - even the truck! I feel they have a great security system and am very at ease leaving my things there. I love that it is climate controlled as well. A Google User 2 months ago I just recently moved in. I had an issue with getting a truck, but Matt went above and beyond to make things work out. I really appreciated all they did! I love how clean everything was - even the truck! I feel they have a great security system and am very at ease leaving my things there. I love that it is climate controlled as well. john murphy in the last week Super clean facility. Office staff is great and professional! Thanks for all your help in getting us set up with a storage unit! Mike Hamlin in the last week We needed to be able to rent a climate controlled space with fairly short notice over the Memorial Day weekend. We arrived 30 minutes before closing time and completed everything, including a tour, with 10 minutes to spare. Very impressed with the clean facility, loading bay for larger moving vehicles and convenient in/out access. I would definitely recommend. A Google User 3 months ago We needed to be able to rent a climate controlled space with fairly short notice over the Memorial Day weekend. We arrived 30 minutes before closing time and completed everything, including a tour, with 10 minutes to spare. Very impressed with the clean facility, loading bay for larger moving vehicles and convenient in/out access. I would definitely recommend. Dale Klingbeil in the last week I am am very impressed with the complete operation. Helpful and knowable staff and a great facility. Rob Kandetzke in the last week I'm back again for the second time in a few years. Since my last experience went so well, I didn't hesitate to call Tom again to rent a unit. Just like last time, everything went very smooth and I can relax knowing my possessions are in good hands. Bridget Waldron in the last week It's so refreshing to work with people who are genuinely friendly while they facilitate the business at hand. My transfer request from one site to another was flawless, and the facilities are top notch. I was impressed by all the user-friendly features that have been put in place to make moving as easy as possible (enclosed loading area that can accommodate even a large moving truck, "street" signs in the locker areas, immaculate steel units, built-in locks on storage units). I highly recommend Storage Master to anyone who needs to rent storage space. A Google User 4 months ago It's so refreshing to work with people who are genuinely friendly while they facilitate the business at hand. My transfer request from one site to another was flawless, and the facilities are top notch. I was impressed by all the user-friendly features that have been put in place to make moving as easy as possible (enclosed loading area that can accommodate even a large moving truck, "street" signs in the locker areas, immaculate steel units, built-in locks on storage units). I highly recommend Storage Master to anyone who needs to rent storage space. Jim Kopps in the last week Tom was very helpful. Free truck to move in with. Clean, weather controlled and secure. No complaints. Jude Ehizielen a week ago Excellent storage facility, extremely clean and A++ customer service...Thanks Tom!! Jason O\'Donnell in the last week Storage master has been awesome to work with. They go above and beyond to make sure your happy with the units and that you are well taken care off. Jason O\'Donnell a week ago Storage master has been awesome to work with. They go above and beyond to make sure your happy with the units and that you are well taken care off. Jason O\'Donnell 2 weeks ago Storage master has been awesome to work with. They go above and beyond to make sure your happy with the units and that you are well taken care off. Jason O\'Donnell 3 weeks ago Storage master has been awesome to work with. They go above and beyond to make sure your happy with the units and that you are well taken care off. Jason O\'Donnell 4 weeks ago Storage master has been awesome to work with. They go above and beyond to make sure your happy with the units and that you are well taken care off. Jason O\'Donnell a month ago Storage master has been awesome to work with. They go above and beyond to make sure your happy with the units and that you are well taken care off. Jason O\'Donnell 2 months ago Storage master has been awesome to work with. They go above and beyond to make sure your happy with the units and that you are well taken care off. Jason O\'Donnell 3 months ago Storage master has been awesome to work with. They go above and beyond to make sure your happy with the units and that you are well taken care off. Jason O\'Donnell 4 months ago Storage master has been awesome to work with. They go above and beyond to make sure your happy with the units and that you are well taken care off. Jason O\'Donnell 5 months ago Storage master has been awesome to work with. They go above and beyond to make sure your happy with the units and that you are well taken care off. Patrick Staggs in the last week The move in was flawless. Everything was what I expected, and the free truck was a GREAT bonus! Barb Brooks in the last week Everything about Storage Master is amazing! First class customer service, super clean and secure, very convenient and decent prices. Would highly recommend Storage Master! Joe B Brooks in the last week Needed a place in a hurry to store household items. Storage Master provided the space needed and it is climate controlled so no worries of a hot space to place personal "stuff", thanks Storage Master! A G in the last week A big whole-hearted "Thank You!" goes out to StorageMaster Franklin, (and Tom who assisted me with everything) You greatly helped today, by being so accommodating, easy to work with, personable, professional, and truly delivering spectacular customer service. I took strong notice of all of it, and it was MUCH appreiated. Please be aware, that I will be recommending your business solely, to all of my friends, family, and clients. You helped alleviate a large amount of stress and inconvenience that COULD have been involved with a large relocation. Instead, it went very smoothly, and I couldn't be happier with the service! Thanks again Tom! Tammy Oswald in the last week Tom was a huge help from my first call while I was shopping around for storage facilities to signing the lease. GREAT customer service and VERY clean facility! I couldn't be more happy with my choice!!! Jeri Nawotka in the last week We have used this location for over 2 years and have been very pleased with the cleanliness and the service. Having access to moving trucks is a great benefit. Tom is very efficient and also helpful and personable. Excellent facility! Highly recommended! Brad Dennis in the last week This place is super clean and very nice. What's amazing is that in my area it is the cleanest AND the best priced. Karin Kingstad in the last week Tom P the manager is awesome. So is the facility in Franklin. Super clean, well lit, good hours. A big benefit of renting from Storage Master is the use of their moving trucks which is so helpful. Can't say enough good about this company. Kathy Kobiske in the last week Great property. Feels safe and secure! Very helpful staff. Would rent from here again if I ever need to. lance tucker in the last week I was in need of a unit that was going to be dry so that the contents I had to store would not get damaged. After checking out the complex I rented a unit for a period of months. The last thing I had to think about was the condition of the material because of how the complex was built. By the way, Tom is very available to answer any and all of my questions. BEST MONEY spent here versus other storage places around the Milwaukee area. Thanks again!!!!! Rob Mcbride a month ago First time customer and I am thrilled with the service I received. The building is very clean and well organized for easy access to the units. Price wise you can't beat it, especially if you are in need of rental truck which was FREE under 100 miles. My contract details were explained in great detail with no hidden clauses. I highly recommend storing your belongings with this company! Pat McAdams a month ago I switched from another company and have been thrilled. The units are big and clean. The facility is easy to get in and out. The people there are great to deal with. I really like the fact that they email me when packages are delivered. Drew Freudenberger 4 months ago This is the place for you storage needs for so many reasons. I picked it because it was climate controlled, the price is a extremely competitive and because of the amazing reviews. It is 40 minutes away from where I live and it was worth it. The facility is extremely clean, new, and run very professionally. Tom was more courteous and helpful that you can imagine. I made a couple of mistakes while moving that other facilities would have charged for, but Tom was generous enough to help and forgive my mistakes. That really showed the type of people I was dealing with and really made my day. Its obvious they care very much about making their customers happy, they remember who you are and they take care of you. Its rare these days to find a business run so well. Craig Mueller 7 months ago Probably one of the most professional storage facilities available. 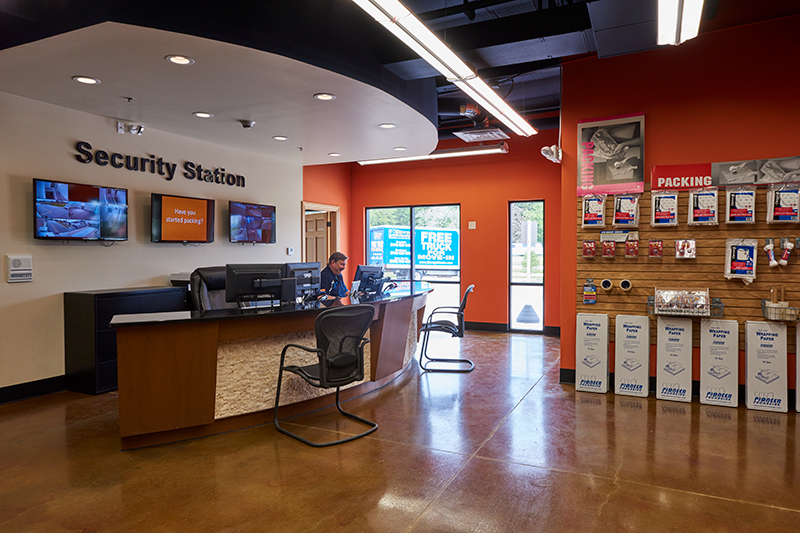 Secure, convenient and well maintained! I needed to relocate out of state about 2.5 years ago and I had about half of a house that needed to be stored. All documents were available online to sign for a storage unit so I didn't need to come in or mail anything. They were even available to let the movers into my storage unit and also held onto the storage unit keys until I could come pick them up. Very professional and accommodating! I highly recommend!